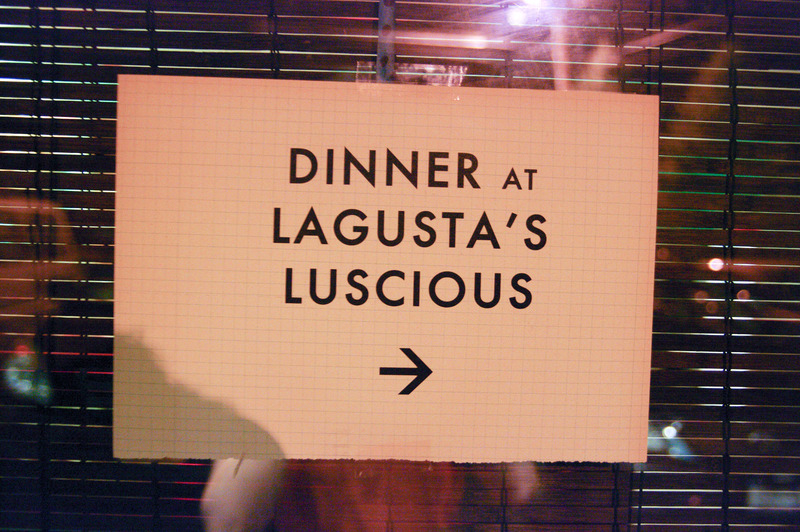 August | 2012 | Lagusta's Luscious! 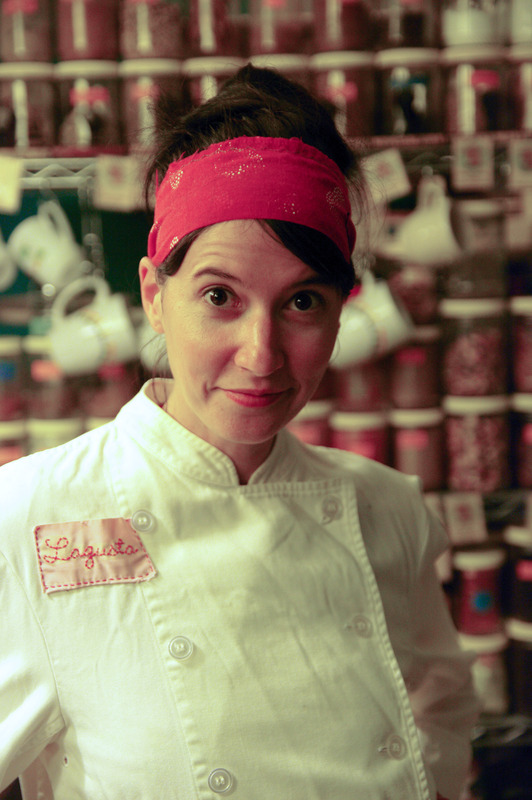 The food journal of a chef/chocolatier in love with relentless flavor, endless umami, ethical sourcing, Hudson Valley produce, and kicking corporations off the dinner table. 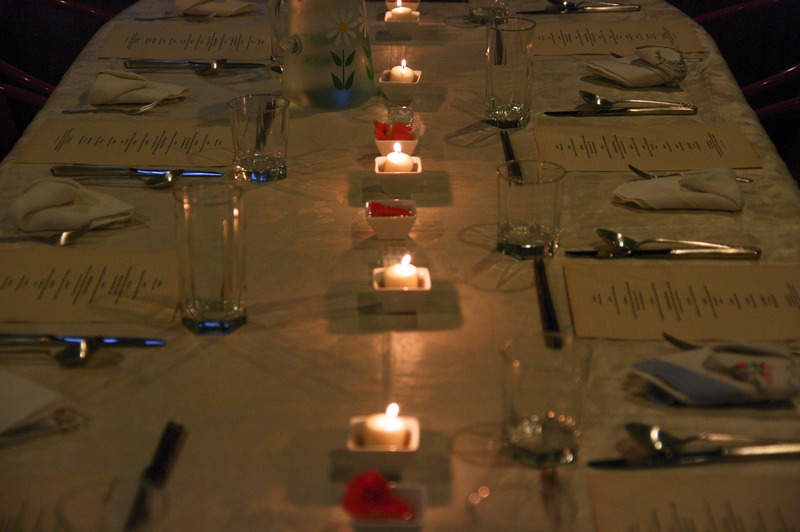 The first dinner in our savory dinner series went so swimmingly, it’s time for another. Mark your calendars now for Wednesday, September 12th, 2012, Thursday, Sept 13, Friday Sept 14, 7:30 PM at LL HQ (25 North Front St, New Paltz). Wednesday and Thursday’s dinners are sold out. We’re opening up Friday, September 14th at 7:30 as well. We currently have 2 seats left for Friday’s seating. 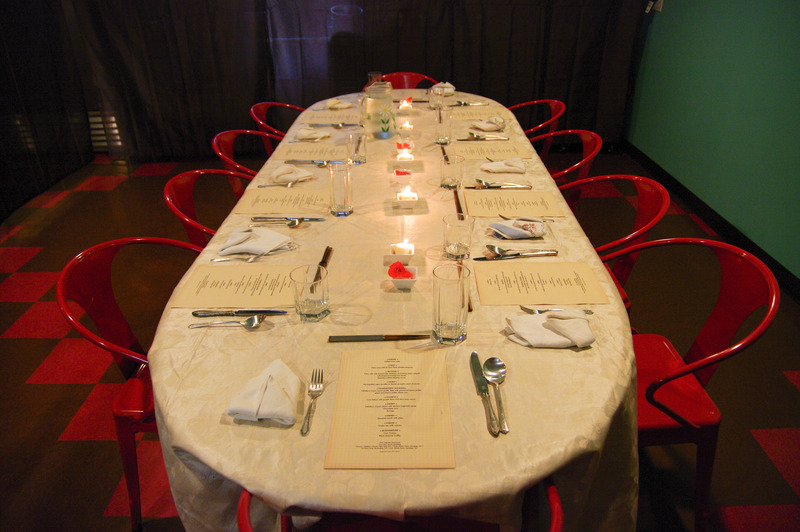 Come into the shop or give a call at 845-255-8834 if you want to prepay to reserve a seat. We have some exciting things happening in chocolate land this fall, and the period from Hanukkah-Passover (OK, really it’s Christmas-Easter that are much busier, but I just wanted to mix it up) are insanely busy for us, so there’s a chance we’ll be doing an October dinner (I really hope so, because cooking fall dishes is my most favorite thing to do in the universe), but there’s a bigger chance we won’t be doing another dinner until…um. April 2013!! So come into the shop or shoot me an email or give a call (845-255-8834, we’ll probably have chocolatey hands/be helping customers and you’ll need to leave a message) to reserve your spot ASAP. 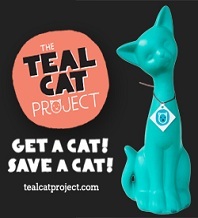 Because if you don’t, we have to make them and…um. I know I’m not supposed to say this, because candy-making is supposed to be all rainbows and sunbeams, but making these is actually rather torturous. 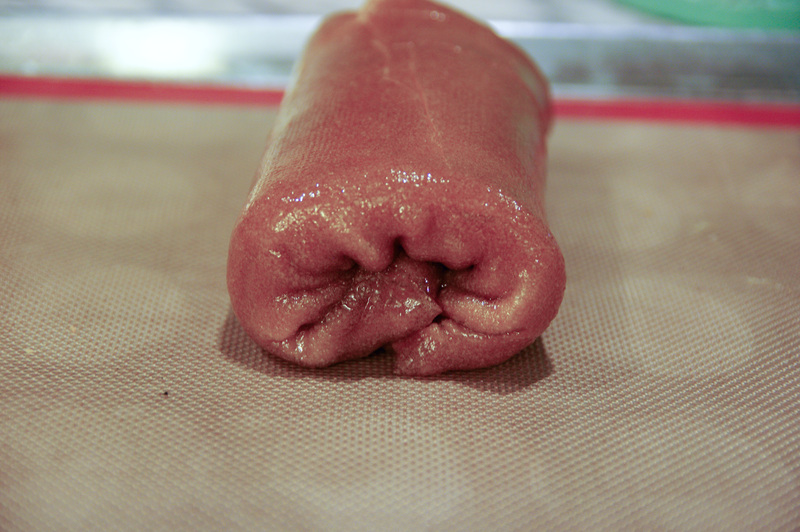 But we’re going to keep making them forever, because they are, horribly, one of the tastiest things we’ve ever made. Just a note to say that yes indeed, I intended to order 20 of the peanut butter bars. My husband requested one a day for a month, and we compromised at 20. They are phenomenal! This bar blew my mind! 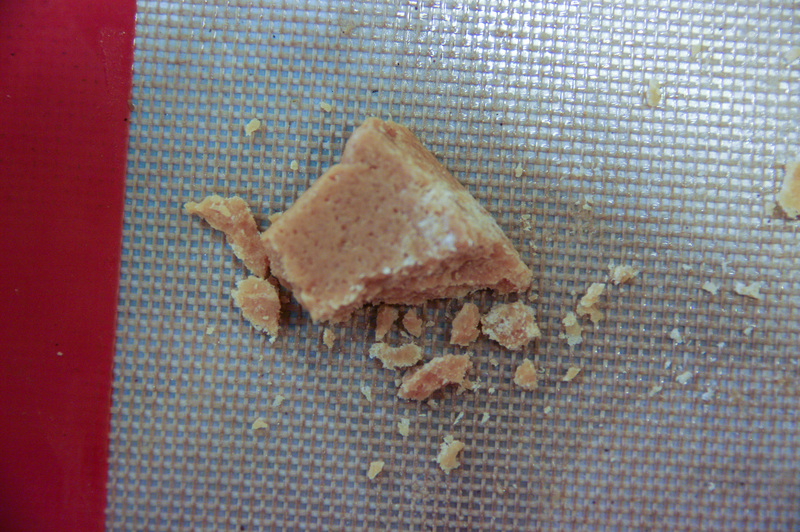 The flaky layers on the inside—not too hard, not too crumbly, not too sweet, just perfect—replicate, nay, upstage and outshine the “real” butterfingers of my youth. This is by far the best vegan candy I have ever tasted. Make it a staple! OMG I love this bar!! And I never liked Butterfingers. That is all. I don’t eat candy and I ate an entire one last night. It was so good. 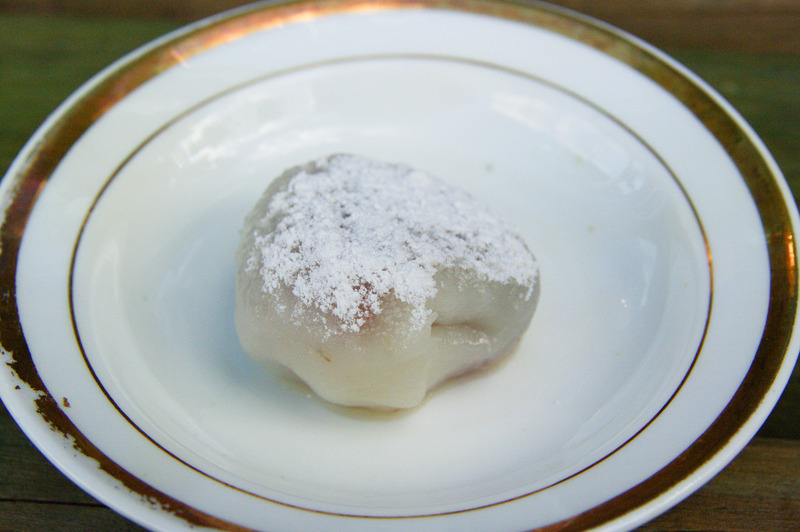 I just had one – and…. Yes, you are going to be making them for the rest of your life! Here’s the recipe. Please share my pain at what a pain it is. Let us begin our journey. Because their beautiful striated layers are reminiscent of the gorgeous mountain range 10 minutes from the shop, the Shawangunk Ridge, which is famous for its stratified folds. 1. CLEAR THE ENTIRE DAY. You will have 24 bars at the end of this epic saga. 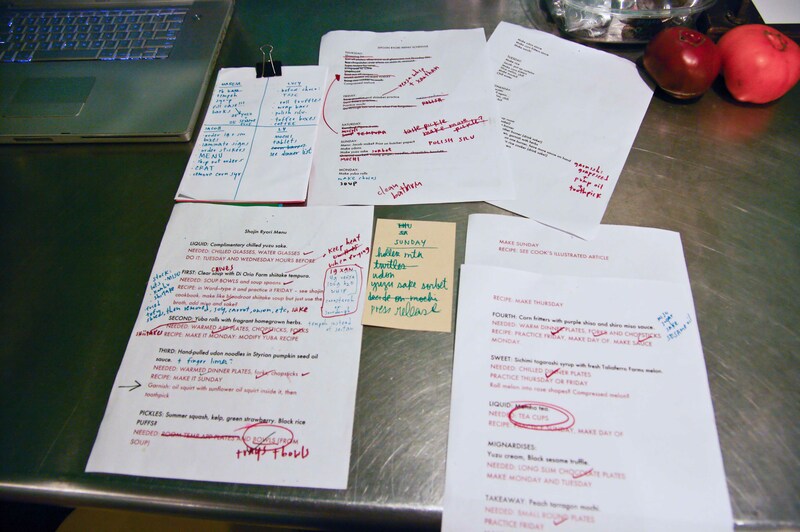 We do four times this recipe, and we swear like sailors the whole time. 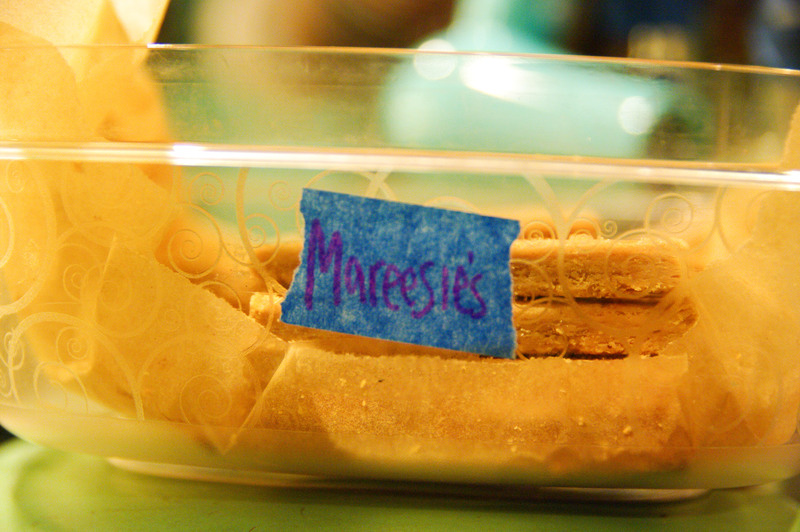 In fact, I whined so much about making these that in the end Maresa took over the recipe (now we call these bars Mareese’s!) in order to save everyone’s sanity from my endless whimpering. I could just tell she thought I was protesting a bit too much about what an ordeal it was. Because of this, I greatly looked forward to her whack at the ol’ recipe. Ready to feel the same way? Have you ever made croissants? 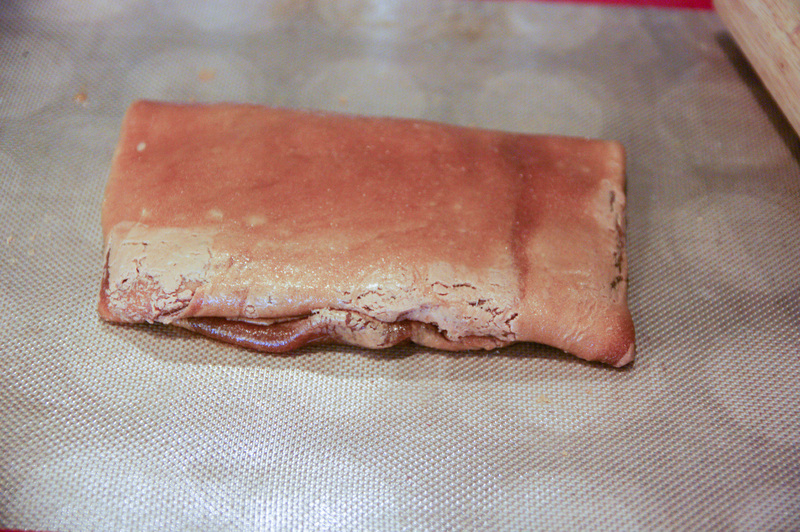 If so, you’ll have a slight jump on this recipe, which is basically the croissant-making technique (puff pastry) crossed with molten hot sugar that requires you to work superfast. It’s a technique called leaf croquant, if you wanna get technical about it. 400 grams peanut butter. 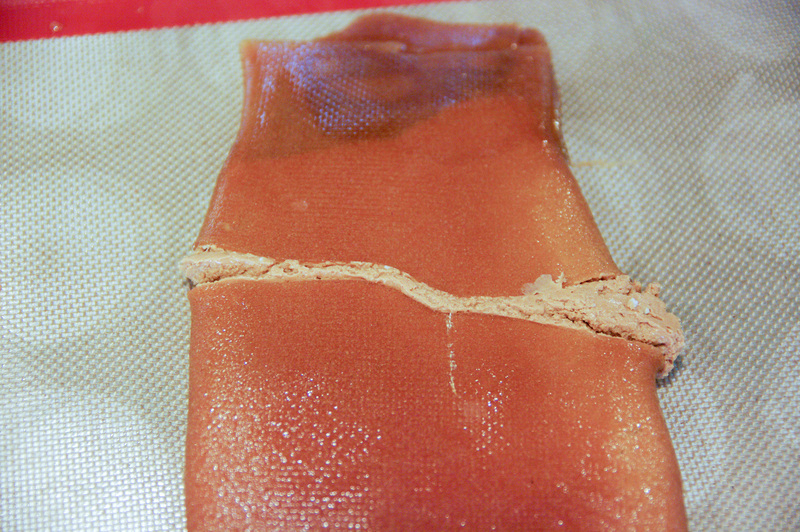 We use organic, salted, smooth pb. 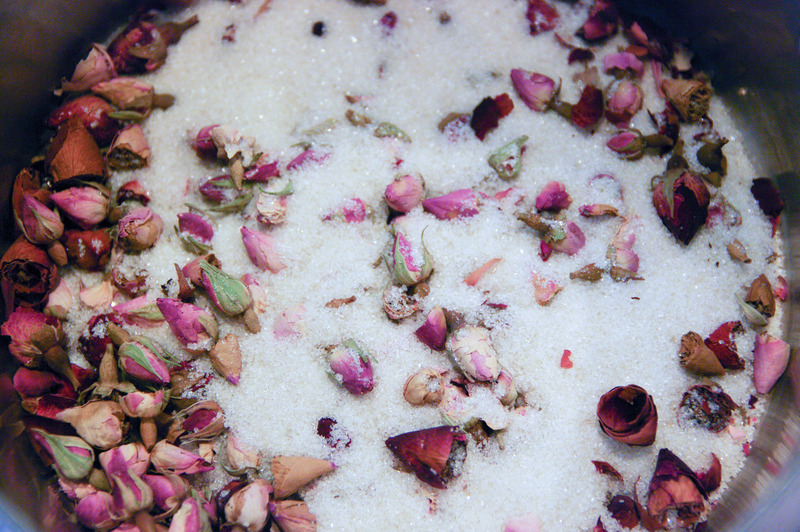 30 grams cane syrup—we make our own based on this recipe. You could use glucose syrup or corn syrup or probably even brown rice syrup or agave syrup. Melt pb in a bowl in a double boiler. 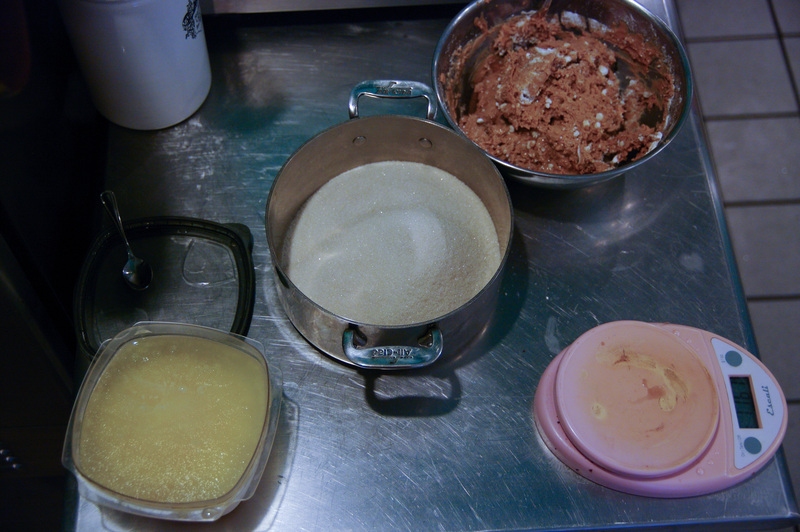 Add sugar (sift it in) and syrup and knead until malleable and smooth. Form into a square 10” x 10” (mine in that photo is pretty ragged, yep.). Keep warm in oven. Rub lemon juice into sugar. 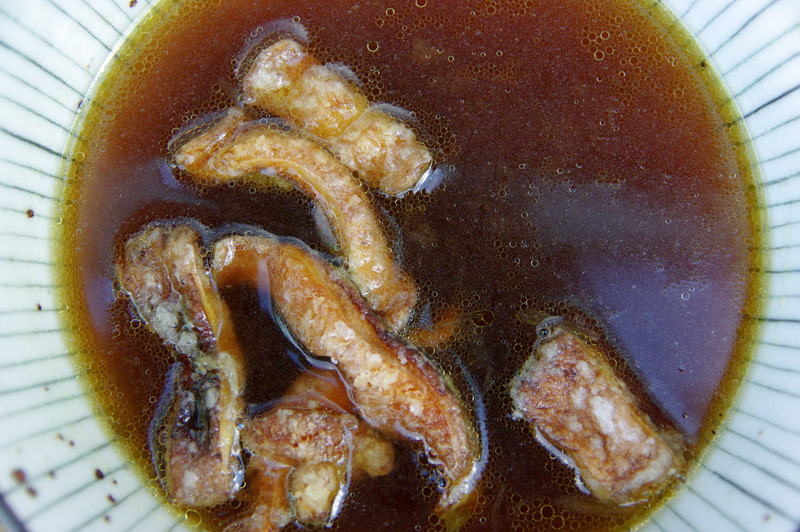 Make a dry caramel by cooking, stirring slowly but constantly, until sugar is evenly melted and becomes a medium amber color (about 10 minutes. Sugar will not be perfectly dissolved and smooth when the color is medium amber, but if you keep cooking it to try to get it perfectly smooth it will burn and you won’t realize it until later. This is hard to explain.). Turn heat to low, add syrup (it will bubble up, and if you’ve burnt it you’ll realize it now because it will get really dark. 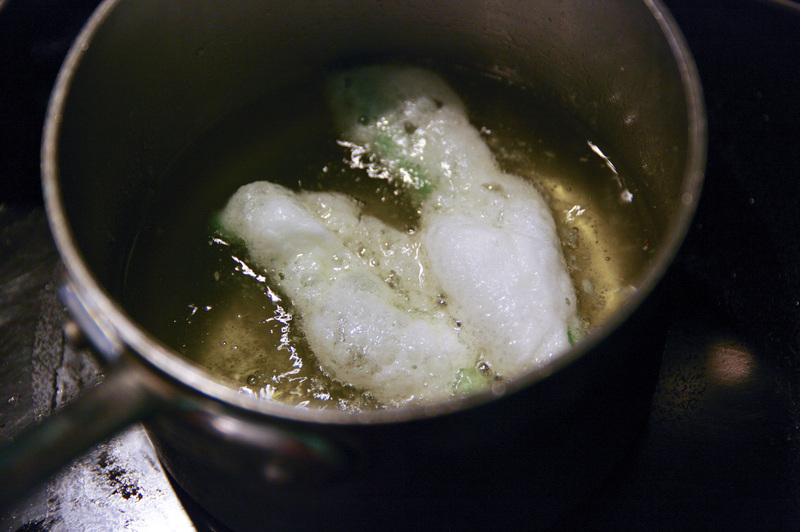 ), and stir until emulsified. 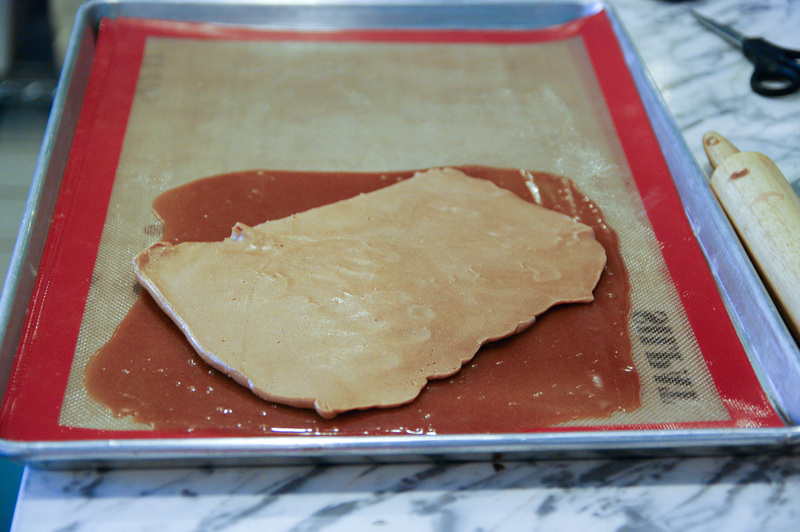 Place the square of pb filling onto one end of the caramel, leaving approximately 1” on all sides. Or thereabouts. 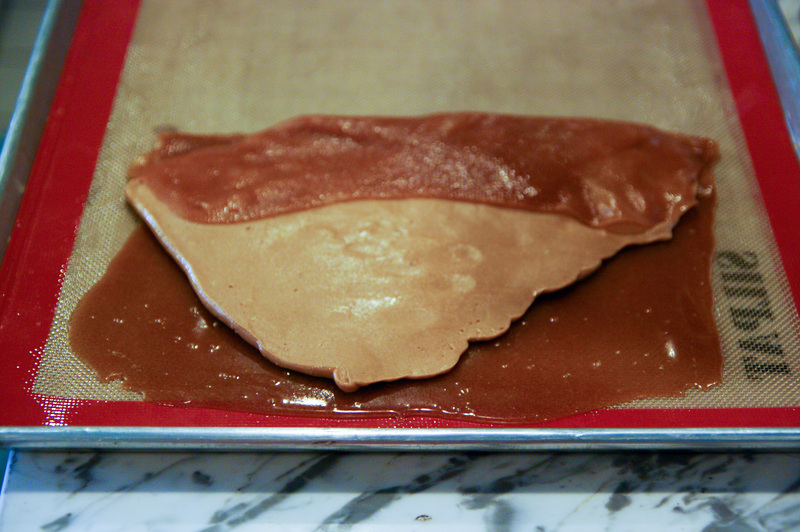 Fold mat and caramel over the filling to enclose it. 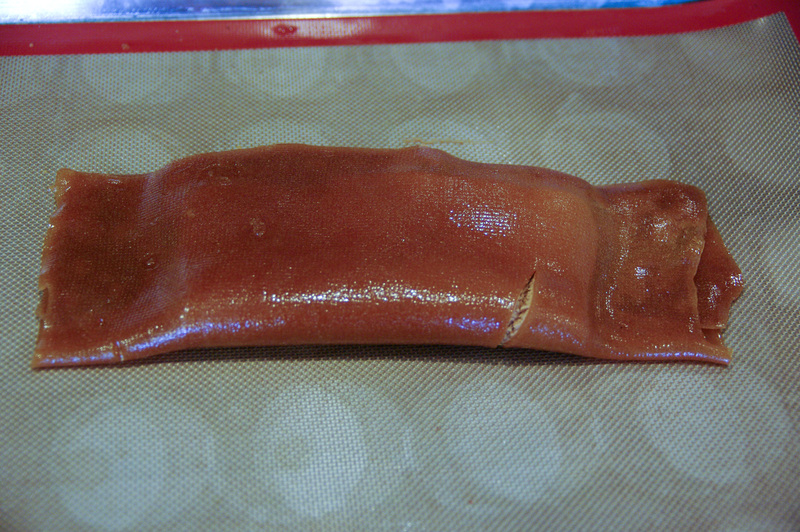 Peel mat off and tightly seal edges of the caramel to envelop filling. 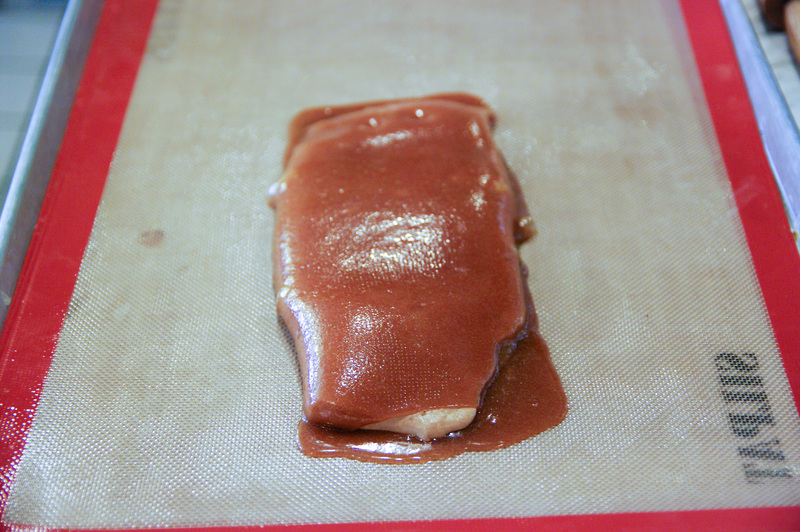 When it comes out of the oven, the caramel will sometimes get so melty that it spills over, like this. That’s OK. Just work fast. 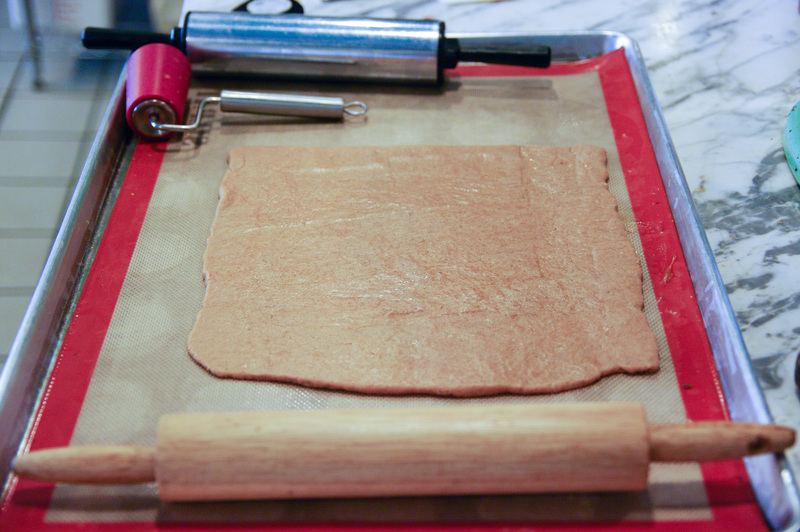 Roll slab into a thin rectangle then fold into thirds. Roll slab to ½” thick, to a 12” x 12” square. Fold into thirds again. You’ve done one turn. 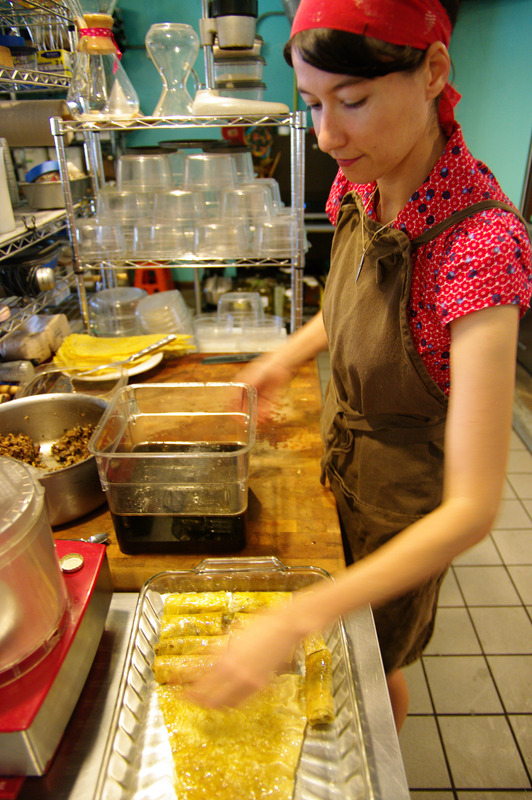 Repeat steps to do four more turns, putting the sheet pan in the oven as necessary in order to make the dough workable. Obviously, working as quickly as possible will make your life a lot easier. But try not to burn yourself with all this business of taking pans in and out of the oven and handling super hot sugar dough. Oh, and around the second to third turn, your arms will start really aching. 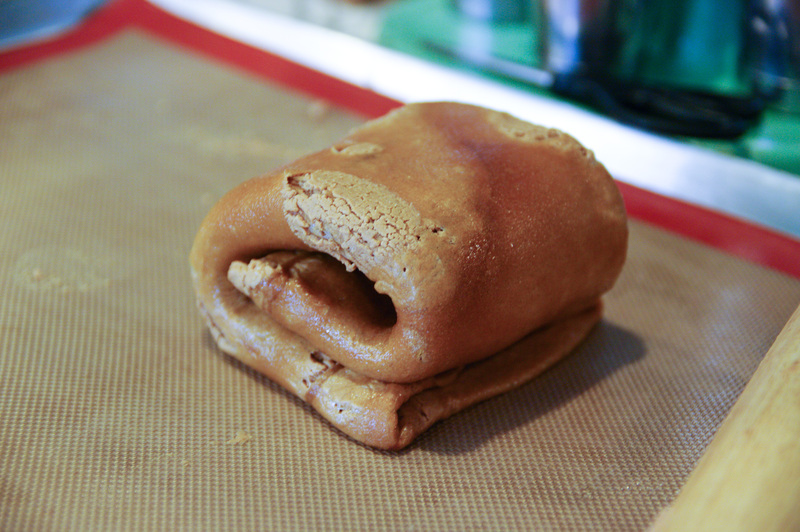 This dough is really hard to roll out, what can I say. After the fourth turn, cut the 12″ x 12″ sheet into 3 rows by 8 rows, to make 24 bars. 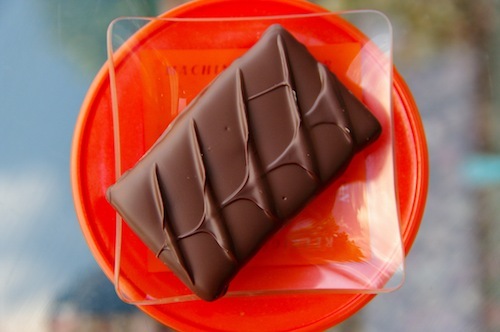 Dip into tempered chocolate (uhhhh…Google it? 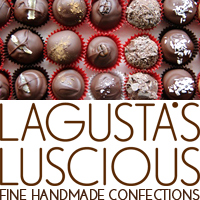 Buy a tempering machine? 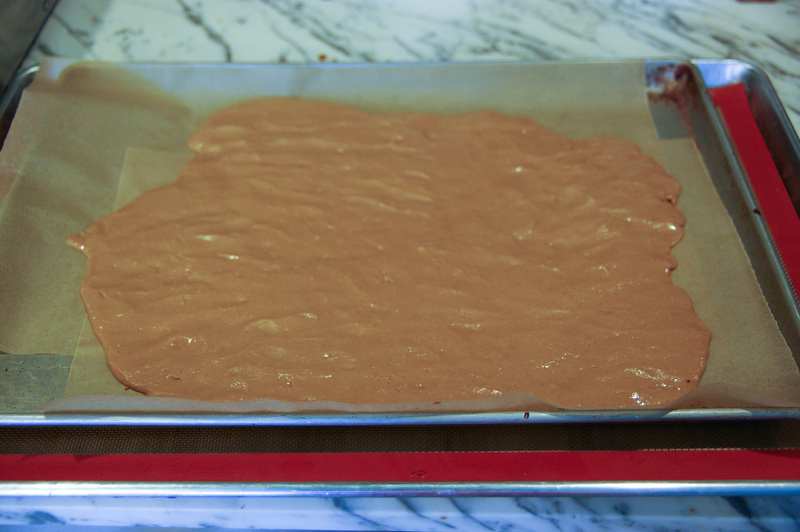 Just smear melty chocolate over ’em!). Just typing that up exhausted me. Luckily, I happen to have a certain indescribably delicious candy bar right here to pep me back up. HOLY CRAP THIS BAR IS SO GOOD! 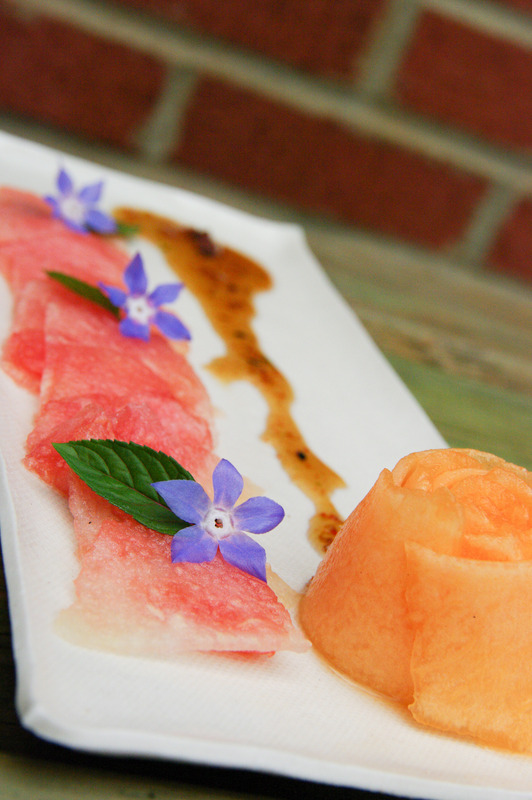 Taliaferro Farms melon with shichimi togarashi syrup. 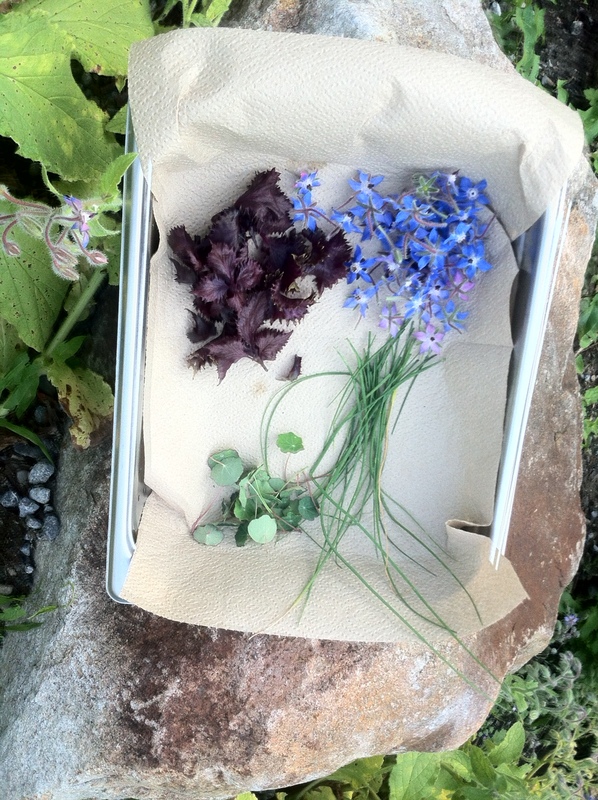 Homegrownnesses: Borage for the melon, chives and nasturtium leaves for the yuba rolls, and purple shiso for the corn fritters. 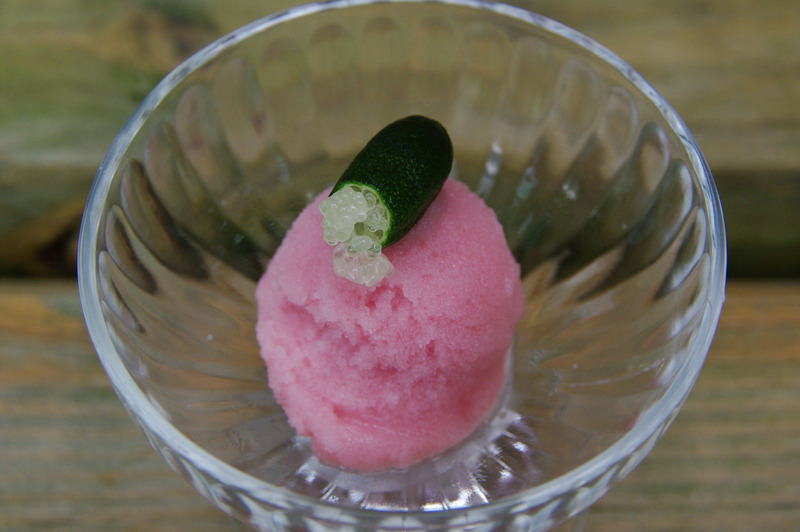 Making the secret course: Yuzu sake sorbet with rose. 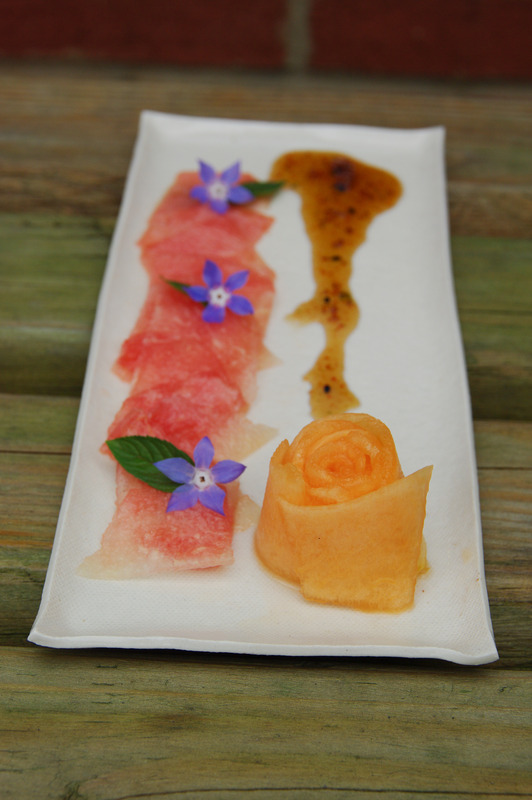 Yuzu sake sorbet with rose….plus! 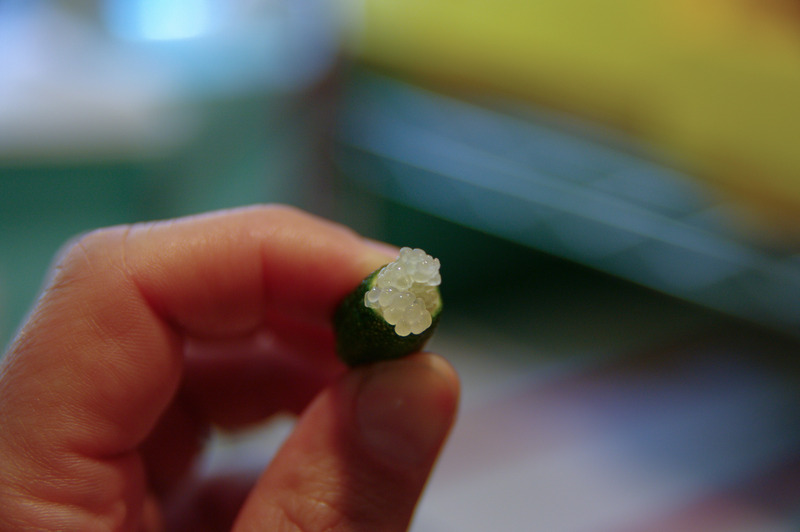 An Australian finger lime! Google it! 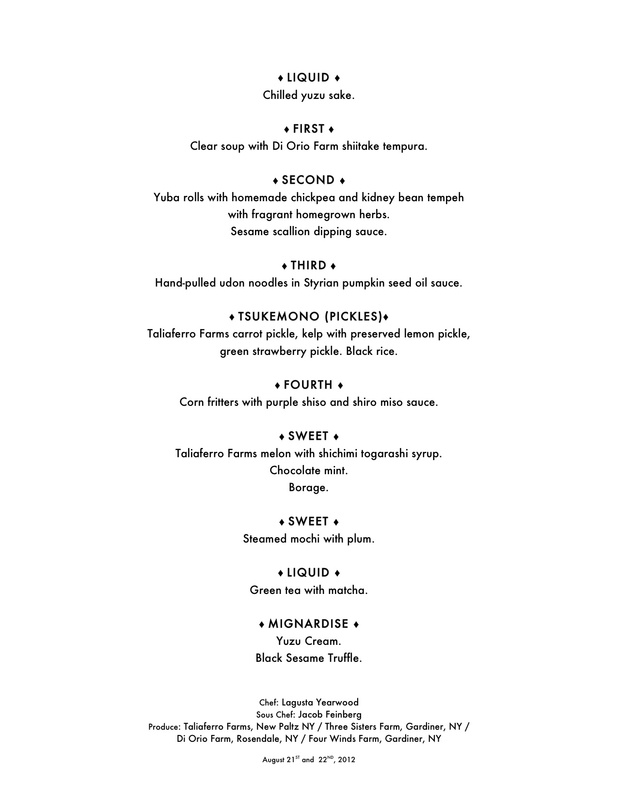 This past Tuesday and Wednesday were the inaugural nights of our savory dinner series. Both nights were truly magical. 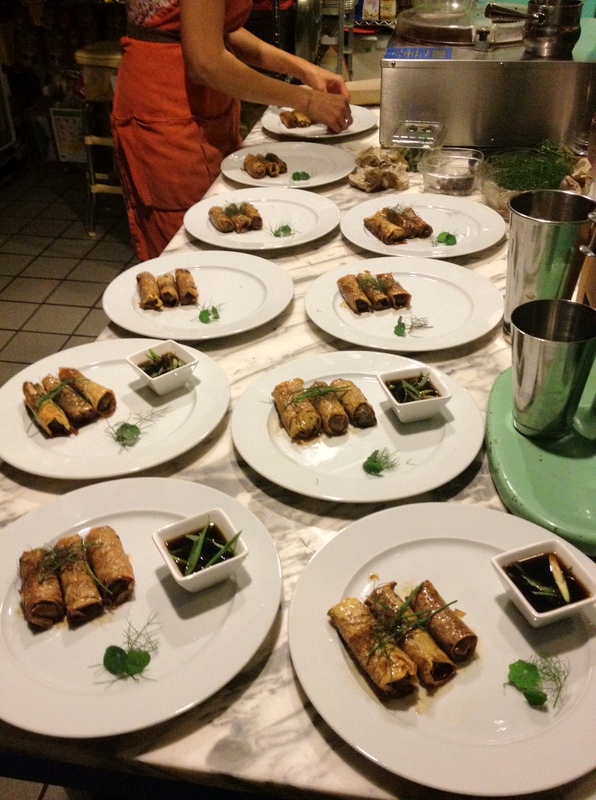 It was such an honor to cook for such a great crowd, and I’ve had such wonderful feedback from everyone. 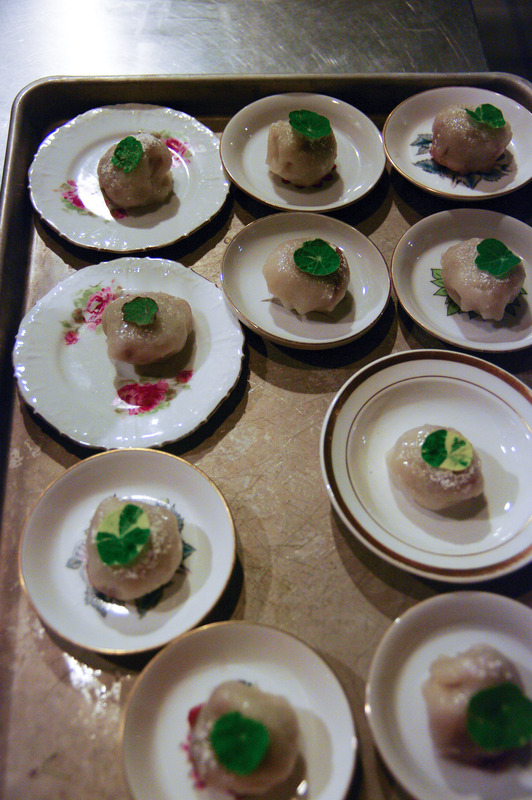 Here are some photos from the process and the dinner itself. 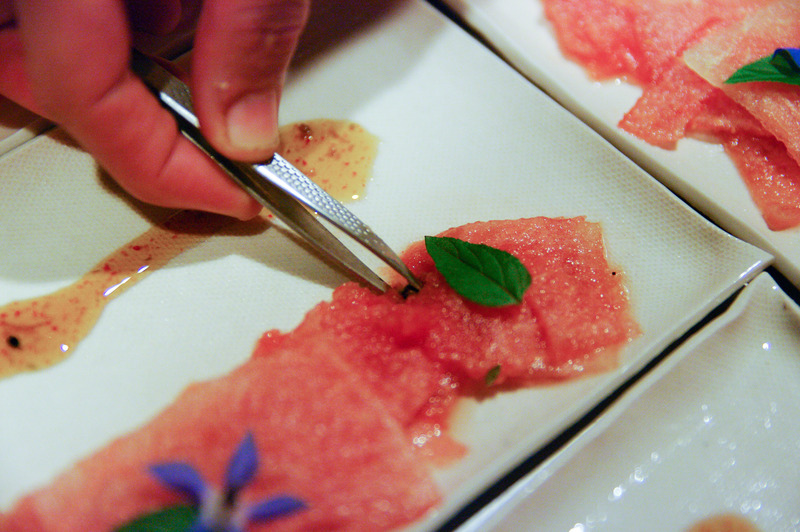 Also, here’s a super lovely blog post with great photos taken by a diner. 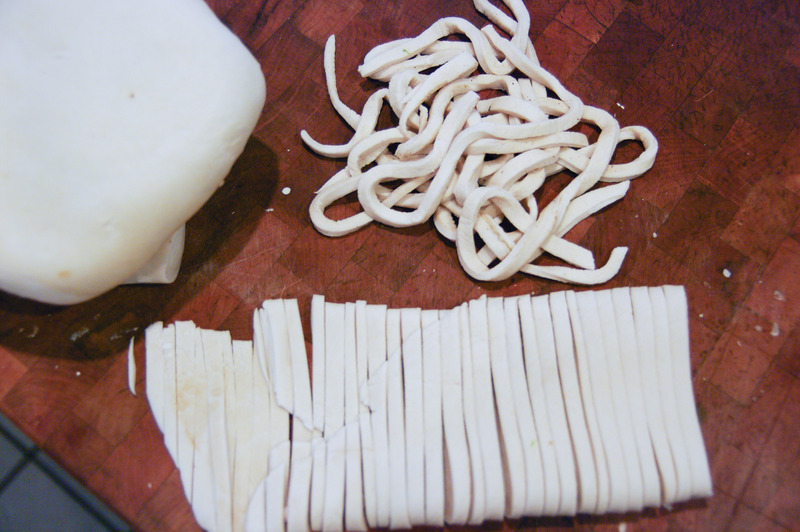 Making shiitake tempura for the soup (recipe for this amazing tempura batter coming soon!). 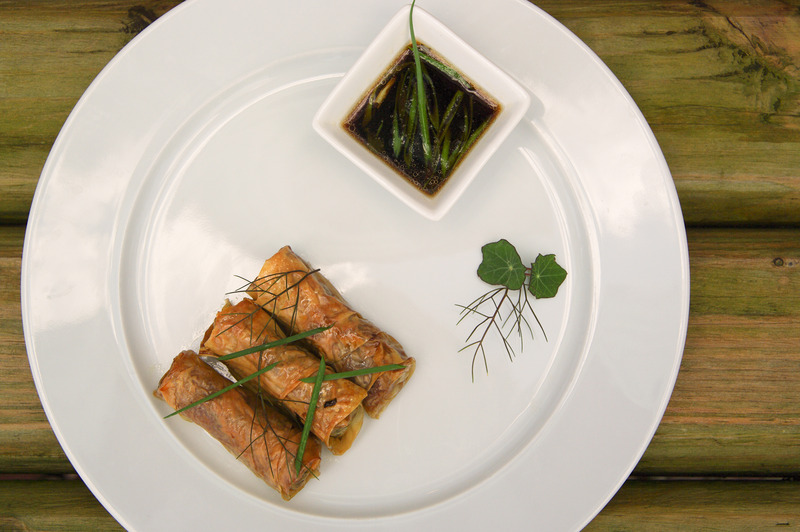 Yuba rolls with homemade chickpea and kidney bean tempeh with fragrant homegrown herbs. 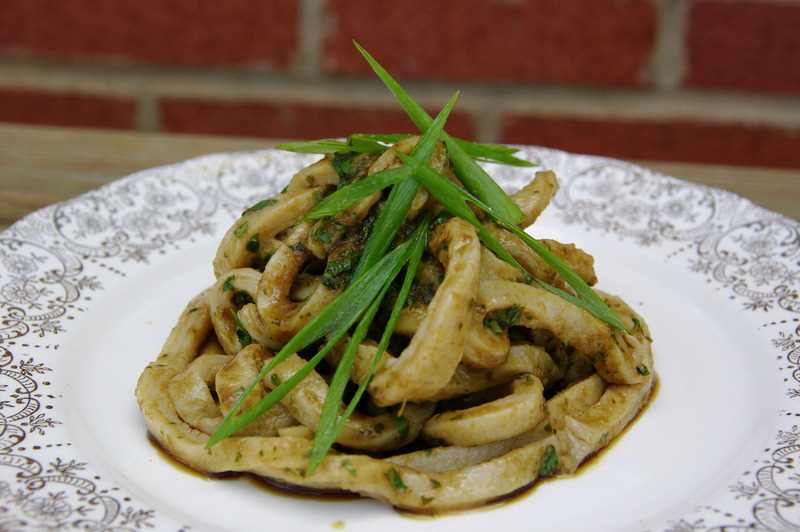 Hand-pulled udon noodles in Styrian pumpkin seed oil sauce. 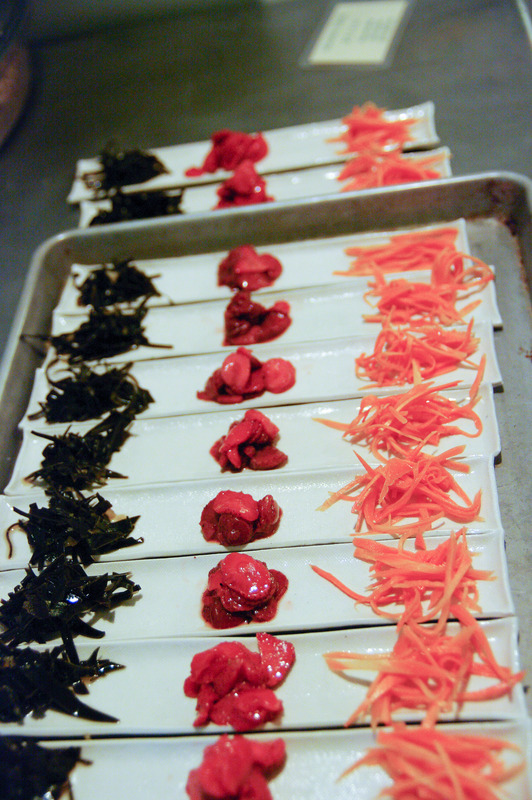 Kelp with preserved lemon pickle, green strawberry pickle, Taliaferro Farms carrot pickle. Black rice. 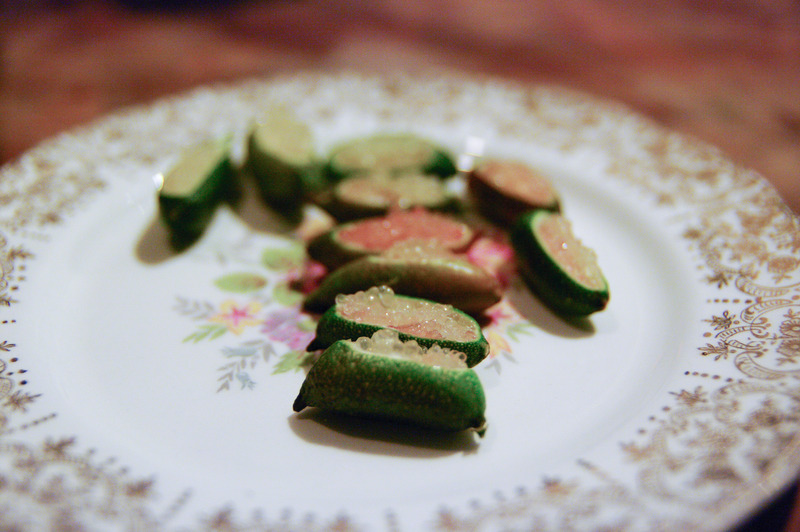 Green strawberry pickles! 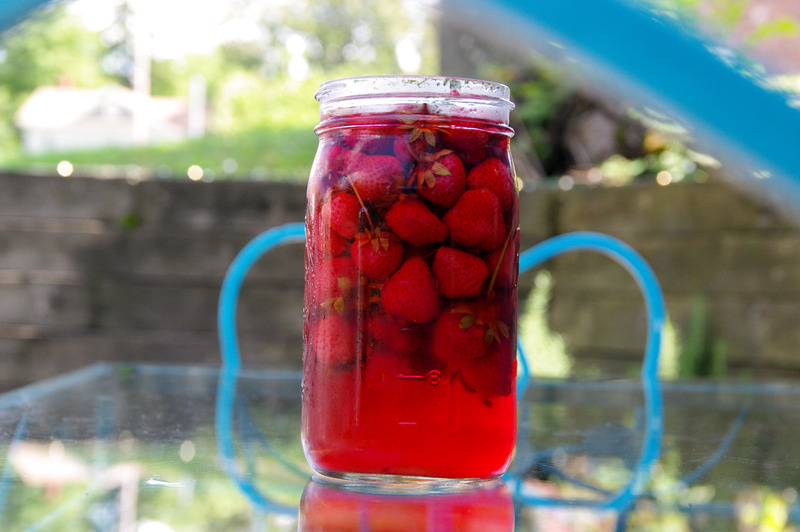 These are unripe strawberries, turned pink from pickling brine, with a few riper ones mixed in for flavor. 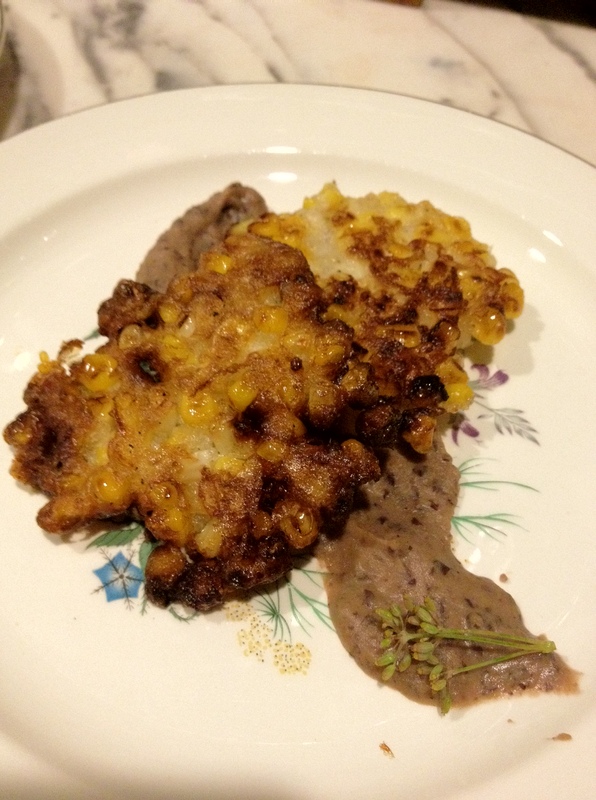 Corn fritters with purple shiso (missing from this photo! )and shiro miso sauce. 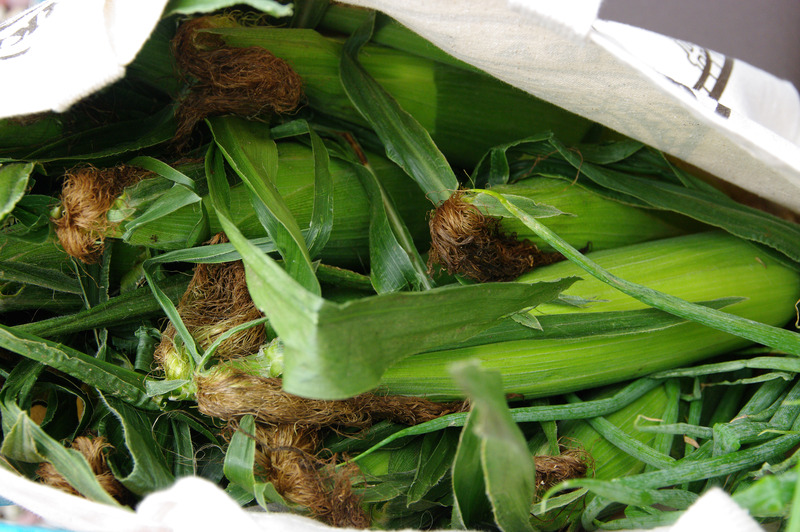 These fritters are just fresh sweet corn, diluted sourdough starter, and salt and pepper. They were CRAZY GOOD, I gotta tell ya. 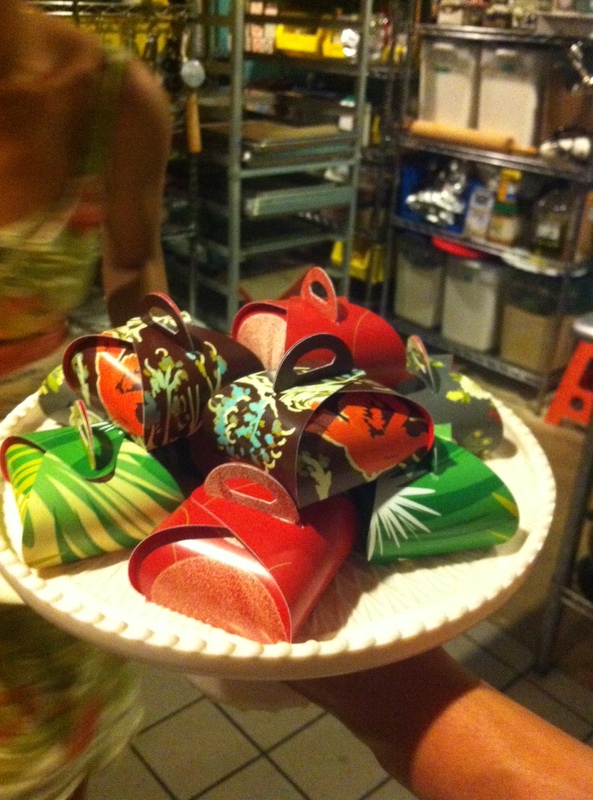 Coming next, Part two: SWEETS! Special discounts + more over in Facebookland! The Gracious Gourmand fancy fancy dinner. The Matthew Dickman poem about us. A day at Bradley Farm. 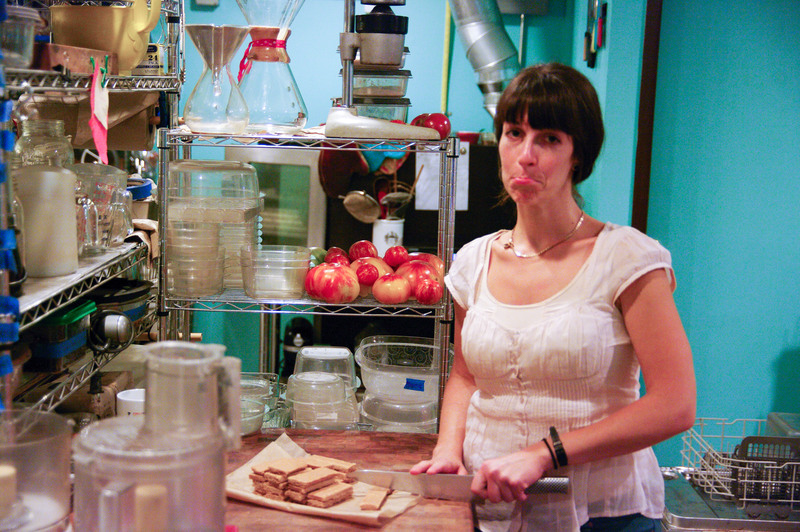 About shuttering the meal delivery service. 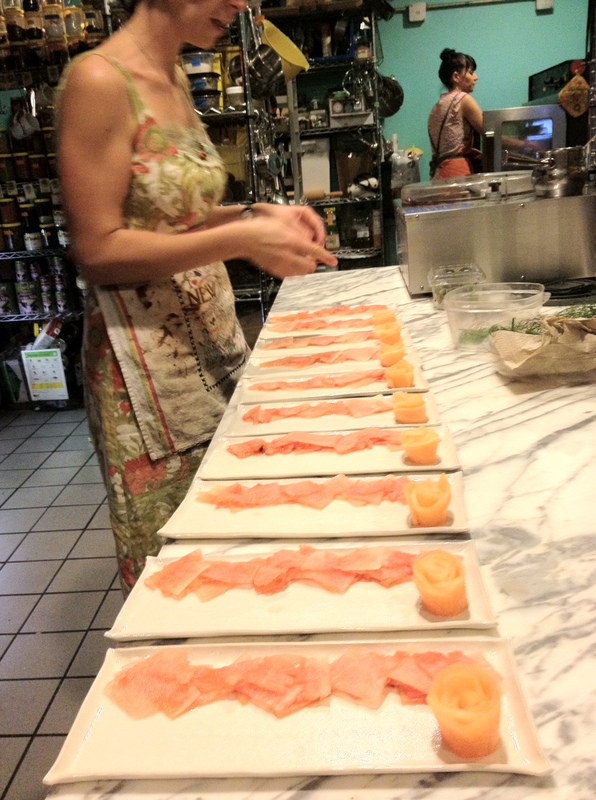 My sous chef as Ellen Page in Hard Candy! Pretty photos of homemde pasta. A pretty week of meals. I mean, really, it's ridiculous. 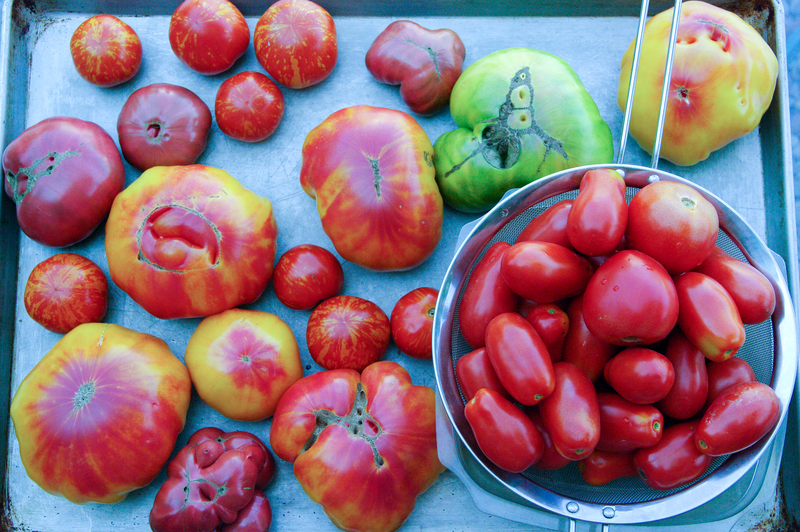 Oh, summertime produce, you seductress, you. Hey, I worked on a cookbook!